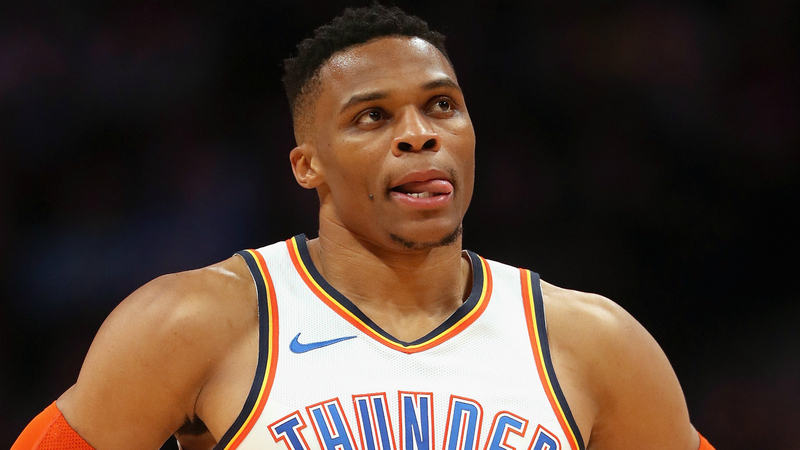 "F*** no" was the response when Oklahoma City Thunder guard Russell Westbrook was asked if he was cool with Philadelphia 76ers center Joel Embiid. Westbrook and Embiid have history and their feud reignited in Oklahoma City's dramatic 117-115 NBA victory in Philadelphia on Saturday. After landing heavily on the court following a foul by Embiid, Westbrook took exception and tried to charge at the 76ers All-Star in the fourth quarter before being restrained. Embiid also waved Westbrook goodbye after the 2017 MVP fouled out during the closing stages. Discussing Embiid's foul, Westbrook told reporters: "I don't think he just landed on me. He added a little bit extra to it but that's okay." Asked if he was "cool" with Embiid, Westbrook - who posted a double-double of 21 points and 10 rebounds - emphatically replied: "F*** no!" The Thunder, though, went on to beat the 76ers and Westbrook mocked Embiid's wave amid the celebrations. Embiid then posterised Westbrook and stared down the Thunder star when the two teams met again in January last year. Speaking to the media following Saturday's two-point loss, Embiid - who finished with 31 points - said: "I don't know why he [Westbrook] was mad, but he's always in his feelings."